News - Justin Bieber gets new owl inking? Justin Bieber gets new owl inking? Justin Bieber appears to have added a new tattoo to his collection. The Baby singer posted a snap online of an owl inking on his arm and told followers he wanted them to see it "befo the paps get me". The new addition comes just a month after Justin got a new tattoo of a crown on his chest. His other inkings include a bird, hands clasped in prayer, and an image of Jesus. 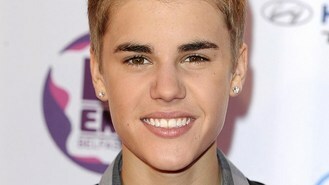 The pop superstar may have taken inspiration from fellow Canadian star Drake, who has an owl tattoo on his shoulder. Justin is currently touring the US on his Believe tour. Musician Edwyn Collins, who almost died from a brain haemorrhage seven years ago, was tonight honoured for his contribution to the music industry. A star-studded gala saw some of the country's bravest citizens recognised in the Pride of Britain Awards. Lionel Richie declared he was having "the best night ever" as he played his first show in London in over two years. Taylor Swift is to co-host the Grammy nominations television special. Ellie Goulding is apparently set to make a cameo in the new series of wild reality TV show Geordie Shore. Chuck Berry has promised a comeback - at the age of 86. Justin Timberlake serenaded Jessica Biel as she walked down the aisle at their wedding. British rapper and record producer Labrinth is celebrating his first number one hit as Beneath Your Beautiful topped the official UK singles chart. Former pop star Gary Glitter has left a central London police station after he was arrested by police investigating the Jimmy Savile scandal.